Congratulations to Klaus Lüftenegger, who delivered his 10th speech from the CC Manual – Inspire your Audience. Inspire us he did, with a speech titled ‘Biking with my Dad’ he painted a clear picture of what it would be like biking in the cold, windy rain with monstrous hills from Nürnberg to Austria. He also challenged us to stop making excuses and to plan and spend some quality time alone with a close friend or family member, and In doing so, we would cherish the memories and bonds we build forever. Congratulations also to Suneesh Puthiyonnan who delivered his Ice Breaker speech. Suneesh introduced himself to the club with some great stories from when we was growing up in a big family in India, to the challenges of learning German and working in Germany. Well done Klaus and Suneesh! 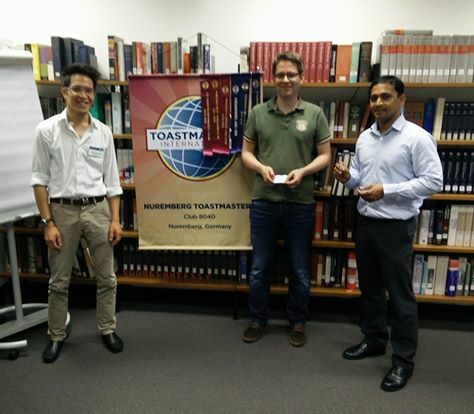 Pictured below (l-r) is Club President – Phuc-An Tran (CC, CL), Klaus Lüftenegger (CC), and Suneesh Puthiyonnan who was awarded his Toastmasters badge. This entry was posted in Uncategorized and tagged CC, Ice Breaker Speech, Nuremberg Toastmasters, toastmasters. Bookmark the permalink.